Bhopal: Why build a toxic factory in a city? “I offer up a thousand thanks to the all-powerful God who has granted that Bhopal enjoy the signal protection of Her Imperial Majesty so that the brilliance of Western science may shine forth upon our land …” proclaimed Bhopal’s Begum Shah Jahan had declared. It was November 18, 1884, when Bhopals railway station was inaugurated with fireworks. When Begum praised the promise of science, it was inconceivable mismanaged science would causes its greatest shame. Yet, 100 years and 16 days later, Bhopal’s KaIi grounds, close by a rail junction, would witness one of the world’s worst industrial accidents. But why was a fertilizer plant built in the middle of Bhopal city? The running commentary of Media often fails to analyze the decisions of distant memory that lead to disasters, amplifying trivial risks and obfuscating serious ones. For many, the factory seemed to offer hope. The rush to industrialize India and the end of poverty promised by the Green Revolution, and a project at first touted for its safety and science were a potent mix. With Independence, Nehru had promised complete self sufficiency, built on heavy Industry, steel production and large reservoirs. However economic growth was slow, “the Hindu rate of growth” as it was nicknamed of 3.2% from 1952 to 1980 was slightly above the population growth. Apparently slow, it was still higher than the 1% experienced under Britain during the first half of the 20th century. And a self sufficiency that seemed blessed by the British Labour government at Independence. But Nehru’s plan performed poorly. Overwhelmingly rural , only 16% of Indias rural 320 million in 1952 could sign their name. The average life expectancy was only 32. In ages past, perhaps India’s youth saluted the sun in prayer, their crops sprung from her new-formed soil, spreading freshness in a primal impulse of gratitude. India needed land reform, but local Congress Big wigs blocked his efforts. In a land where 4/5th of the people were on the land, the rural budget declined from 1/3rd during the 1952 five year plan, to 1/5th in 1957. The failures of Nehru’s socialist Swadeshi was apparent when in 1967 Indira Gandhi, appointed Prime Minister the year before, dependent on food aid to feed her people, was forced by the USA and IMF to devalue the rupee. It was hoped increased exports would bring India foreign exchange. Indira had promised that the eradication of poverty should be India’s first priority. Criticism of her failures later revealed her dictatorial streak to a legal challenge resulting in the Emergency, when Democracy was suspended and social reforms such as birth control forced on the populous. While we mourn the loss of Bhopal, let us remember that the Green Revolution has seen Indias average life expectancy rise to 66 years. Carbide India Ltd. (UCIL) was founded in 1934, an produced batteries, carbon products, welding equipment, plastics, industrial chemicals, marine products and chemicals. 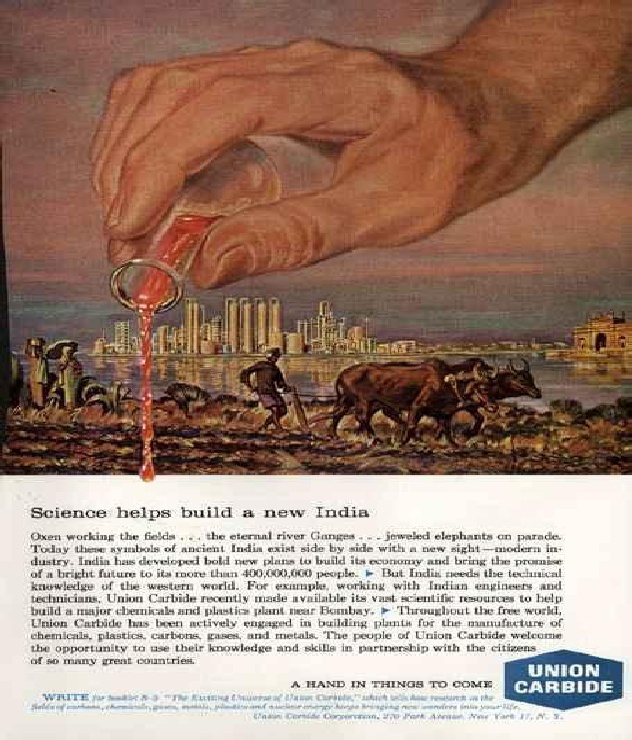 In 1966, Union submitted a proposal to the Indian government for “erection of facilities for the manufacture of up to 5000 tonnes of Sevin Carbaryl insecticide”. Unacted on, in 1970 Union Carbide Corporation (UCC) revealed a new technology using Methyl Isocyanides (MIC) that halved the production cost of the pesticide Sevin. 30 years on I have talked with an ex Carbider, who with her husband continues noble charitable work in Bhopal, while recognizing the company’s responsibility, questions why the government should not take responsibility for allowing people to live near the plant. It is a good question. In 1975, M. N. Buch, a top bureaucrat respected throughout India for his efficiency and integrity, had asked Union Carbide to move the plant away from its present site because of the rapid growth of residential neighborhoods around it. Mr. Buch was transferred from his post. Had there been no disaster, corruption may have been seen as necessary to power India’s Green Revolution. But it did, contrary to assurances of safety. When journalist journalist Rajkumar Keswani discovered irregularities in the allocation of industrial licenses and discovered collusion between Carbide and the local government. Since then, Wikileaks has confirmed the Government of India allowed Union Carbide, USA to bypass the Foreign Exchange Regulation Act, and obtain loans from American Exim Bank instead of an Indian financing agency. This was supported by the USA. Diluting the FERA allowed Union Carbide to retain majority ownership . In the 1970’s UCIL managers were in constant contact with the US embassy to lobby for exceptional terms favourable to the company. Then US ambassador has since confirmed moneys been paid to Congress officials. A fire in 1978 there had been a fire and in December 1981, Mohammed Ashraf died after inhaling phosgene. After collecting witness statements and was smuggled into the plant by a dismissed trade union leader Bashir Ullah, Keswani accused Carbide of violating its own safety standards. In May 1982, three American engineers from the USA had “uncovered over sixty breaches of operational and safety regulations” which were cited by Keswani. Keswani wrote three articles of warning of the serious risk of disaster in 1982, and a fourth in June 1984. He also wrote a letter to Chief Minister Arjun Singh was ignored, and the minister assured the Assembly that he personally inspected the Carbide plant and nothing was wrong. Meanwhile, plant manager Warren Woomer, left India believing all the problems revealed by the safety review would be resolved and Sevin would help India’s peasants. He also strongly recommended his successor keep a strict minimum of dangerous materials and MIC always be rigorously refrigerated. Warren may have “belonged to a breed of engineers for whom one single defective valve was a blight upon the ideal of discipline and morality” but drought cut sales. Under the series of future mangers cut backs followed. Carbide flooded the countryside with posters of a Sikh holding a packet of Sevin proclaiming “My role is to teach you how to make five rupees out of every rupee you spend on Sevin.” Only 2,308 tons, half the production capacity, were sold in 1982, and 1983 looked worse. Even as staff was halved, many still believed that Carbide would ride hard times and always remain for Bhopal and India. 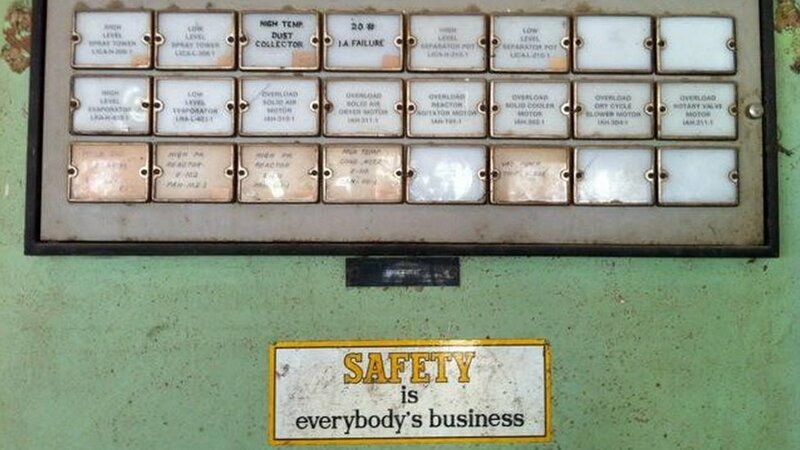 “Carbide wasn’t just a place to work. It was a culture, too. The theatrical evenings, the entertainment, the games, the family picnics beside the waters of the Narmada, were as important to the life of the company as the production of carbon monoxide or phosgene” stated mechanical engineer Arvind Shrivastava. “The management created cultural interest and recreational clubs. These initiatives, which were typically American in inspiration, soon permeated the city itself. The inhabitants of Bhopal may not have understood the function of the chimneys, tanks and pipework they saw under construction, but they all came rushing to the cricket and volleyball matches the new factory sponsored. Carbide had even set up a highly successful hockey team” wrote Lapierre in Five Minutes past Midnight in Bhopal. Sadly, the loyalty it inspired could not last. A lesson for the new India? I often walk past the guest house gate, abandoned besides the Bharat Bhavan, just as I have walked through the Union Carbide site. As I read of the mismanagement of disaster funds, of the poor health management that followed and the incredible delay to undertake a study of the effected I wonder if the the then government has as much to be ashamed off as Union Carbide. Perhaps, that is why justice is so long in coming. As the 30th anniversary of the disaster approaches, I am reminded of the 1912 sinking of the Titanic. world hopes of technological progress were mortally wounded when the by an iceberg and along with confidence in Britain’s social class structure, killed off by World War I. The forces that held back Indias economy in Nehru’s time have changed by information technology. In contrast to China’s labour intensive economy, India’s economy is capital intensive, under utilizing hundreds of millions of unskilled labourers, many leaving the land. Bhopals disaster is not loudly discussed in the City of Lakes, but its presence is always felt. 150 television channels now allow the poor to see a the glitter of good they are supposed to want but can never afford. Bhopal reminds me that long term India must involve the rural poor, or risk the discontent of the underclass left behind by the new India. Wikileaks revealed that as late as 2007 the USA threatened to link investments in India to the country’s stand on Dow Chemicals, one of that nations largest corporations that bought out Union Carbide. Writer Edward Luce (In spite of the God’s, p. 32, Abacus, London 2011) the death knell to this dream followed the loss of India’s foreign currency reserves when Iraq torched Kuwait’s oil fields at the Gulf War. Dominique Lapierre and Javier Moro, Five Past Midnight in Bhopal: The Epic Story of the World’s Deadliest Industrial Disaster, Grand Central Publishing, 2009.